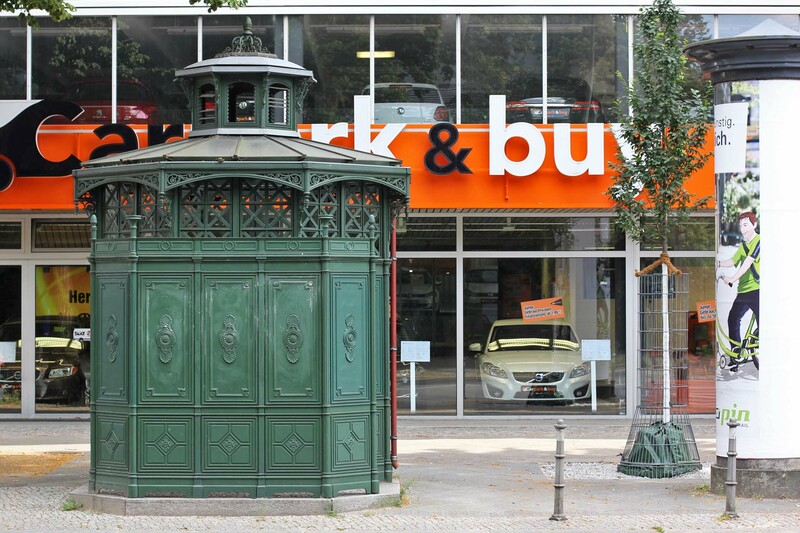 If you’ve spent time wandering around Berlin you may have occasionally noticed a small green metal hut that looks a little like a summer house but did you stop to wonder what it was? 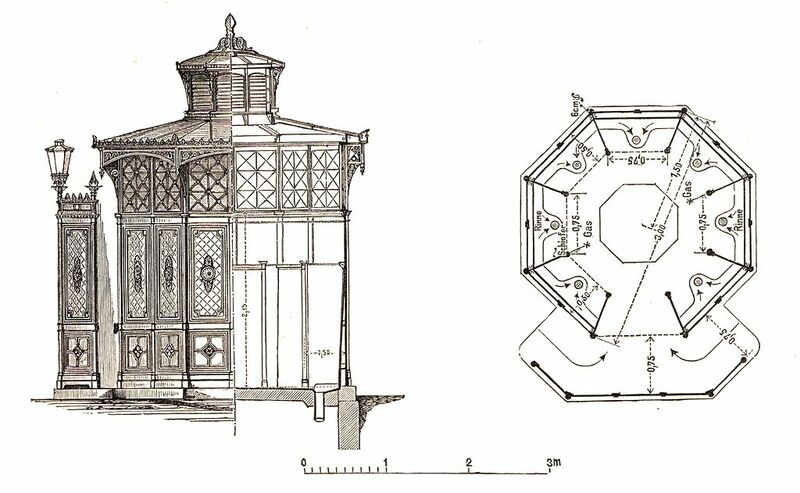 The structure you noticed, known locally as a Café Achteck (Octagonal Café), is actually a toilet. 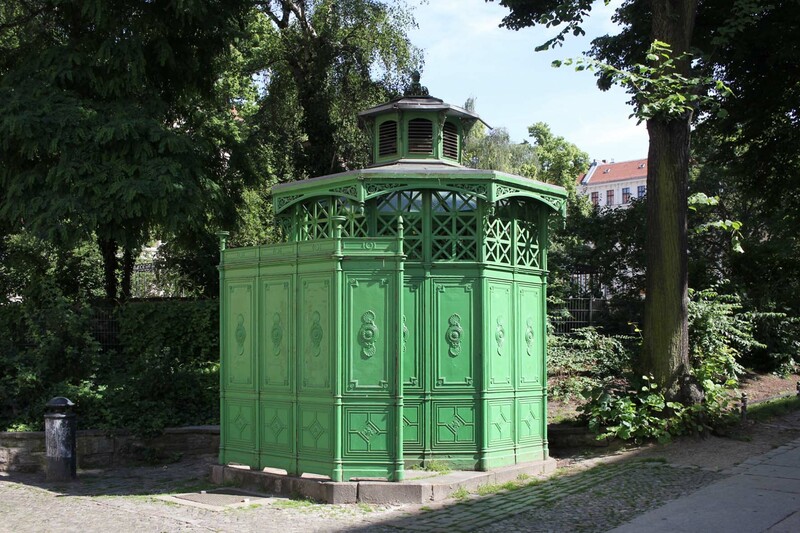 I saw my first Café Achteck at Senefelderplatz on my first visit to the city and stopped to appreciate the simplicity of its design and form. 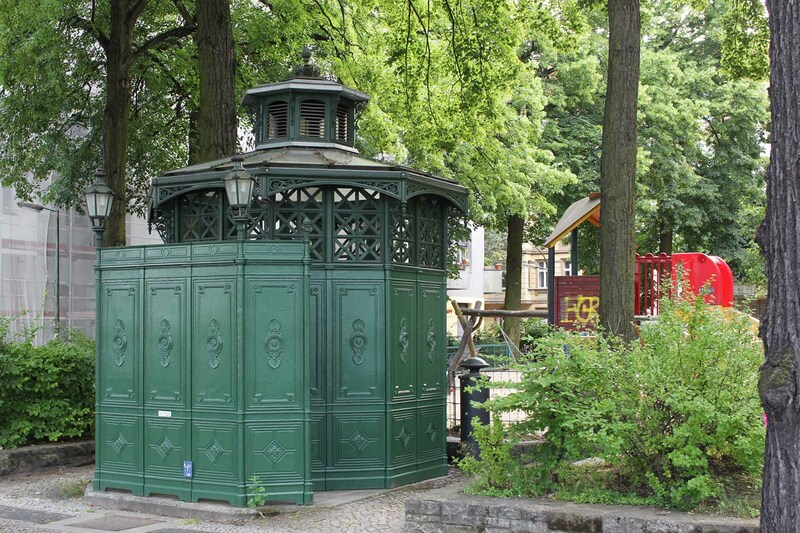 It wasn’t until I saw the ‘Herren’ (Gents) and ‘Damen’ (Ladies) signs on a similar cabin on the Gendamenmarkt that I realised the true nature of the construction that I had so admired. 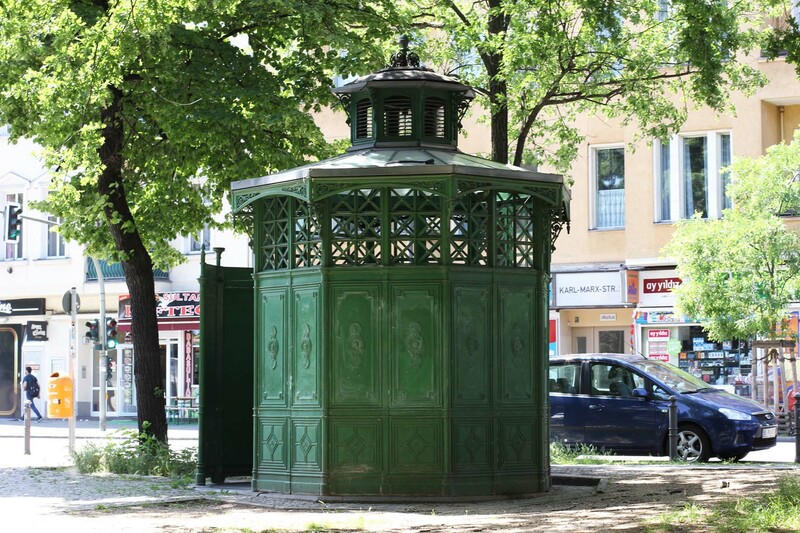 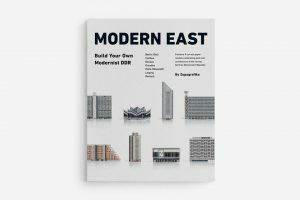 The history of these iconic public toilets can be traced back to the mid 19th century – Berlin was lagging behind modern capital cities like London and Paris in their approach to sewerage and the city’s growing population was increasingly offended by the resulting stink. 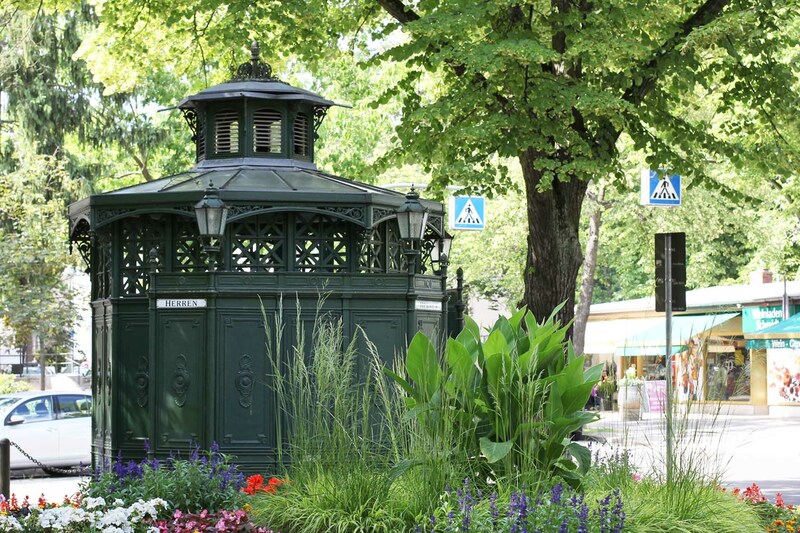 An increasing awareness of the link between hygiene and sickness further forced the issue and under Hinckeldey’s successor, the first public urinals were installed in 1863. 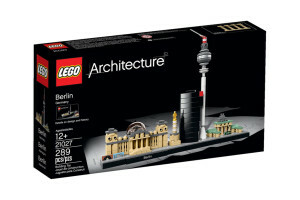 These original models were oval with space for two men. 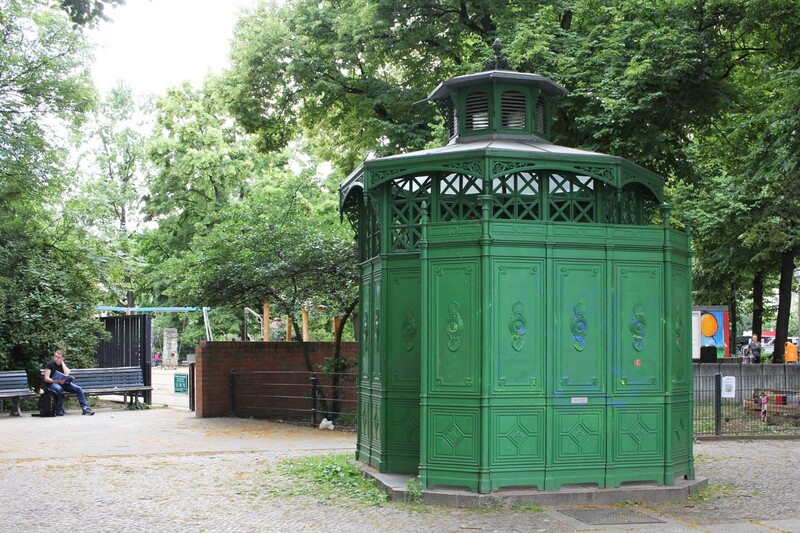 Berlin’s head of city planning, Carl Theodor Rospatt, recognised that these two-man toilets were inadequate for Berlin’s rapidly growing population. 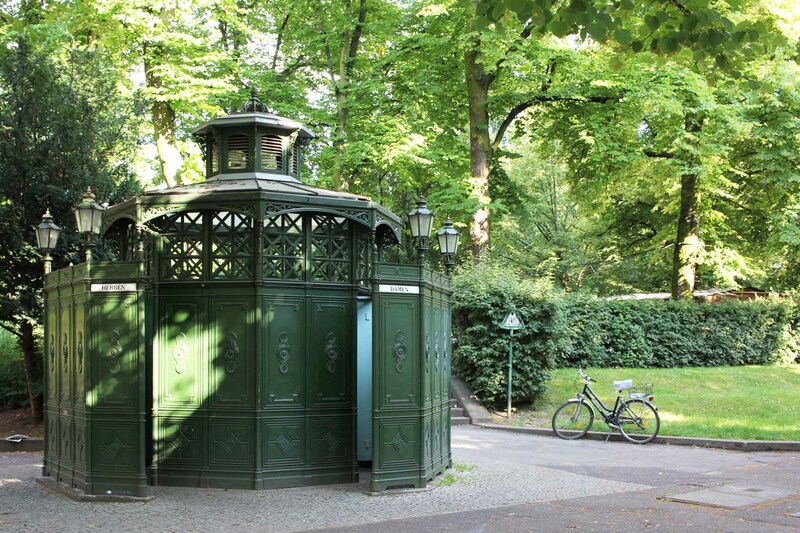 It was he that introduced the eight-sided, forest green, cast iron constructions officially known as the ‘Waidmannslust’ in 1878, that Berliners gave the nickname Café Achteck. 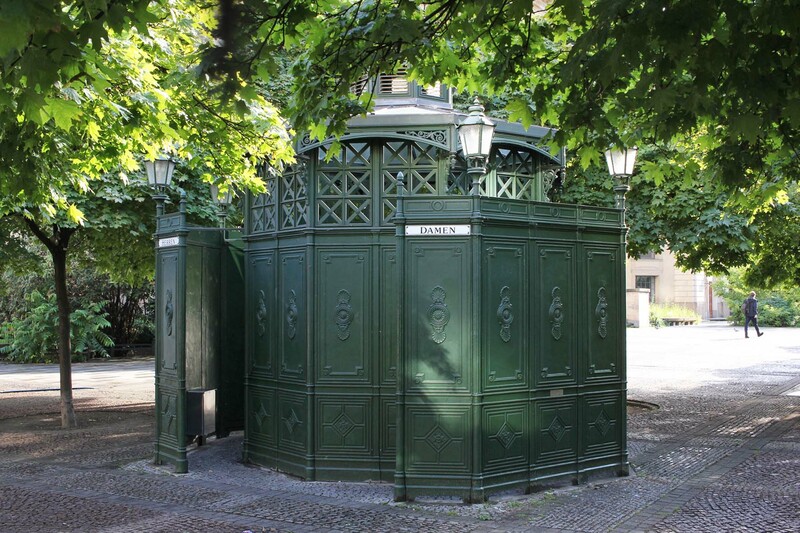 These new pissoirs, with standing room for 7, eased the pressure on the male bladders of the city but to this point the needs of women had not been properly considered. 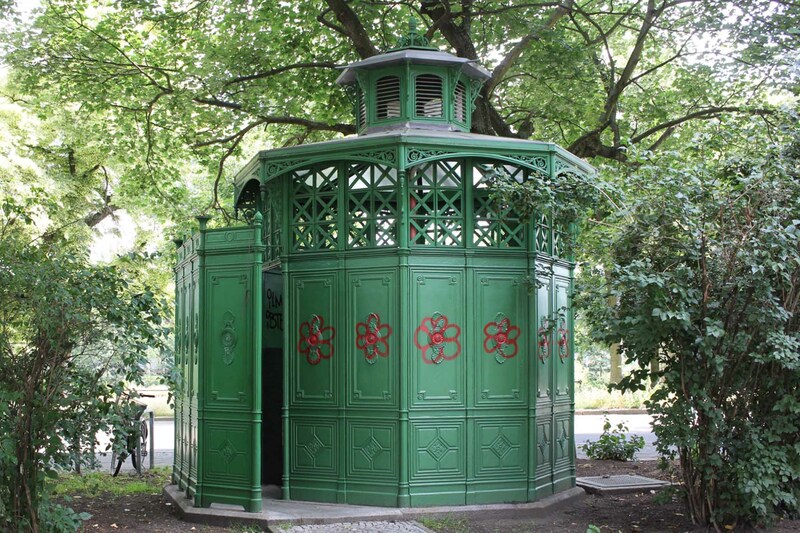 Public toilets for women were originally discounted due to security and decency ‘concerns’. 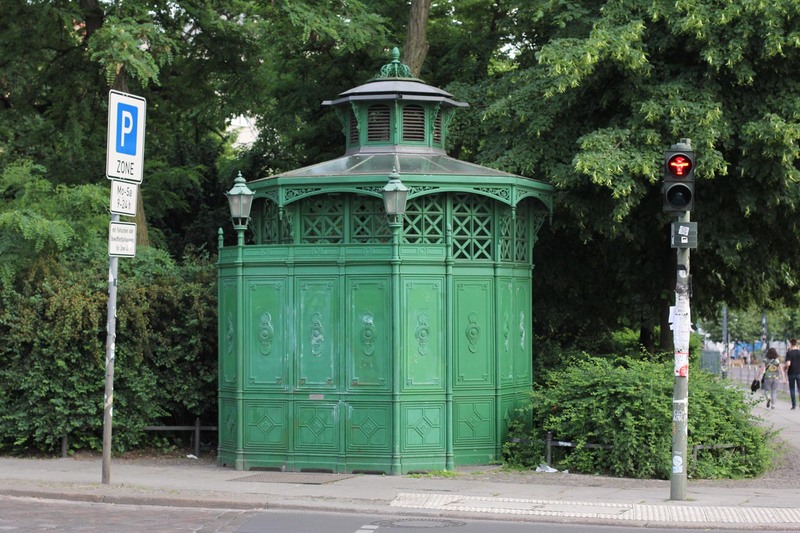 The first toilets for both sexes were built in 1879 and by 1899 a larger rectangular cast iron design in the style of the Café Achteck, with stalls for men and women, was used on the streets of Berlin. 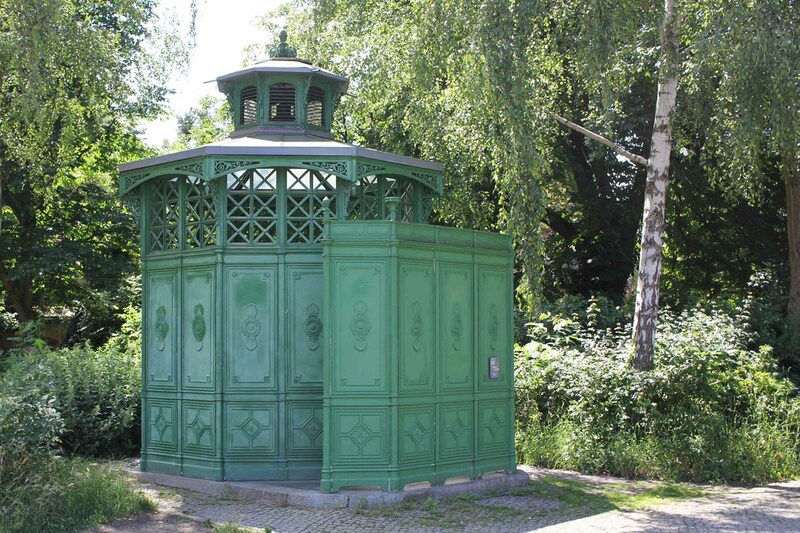 By the turn of the 20th century there were more than 100 Café Achteck pissoirs in Berlin but only a handful have survived. 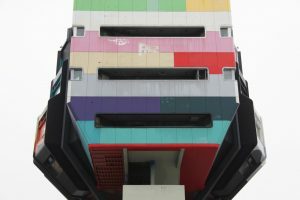 A layer of green paint was of course no defence against the bombs that fell on Berlin in the war and due to a lack of maintenance, particularly in Cold War East Berlin, many of the remaining metal structures succumbed to rust and vandalism. 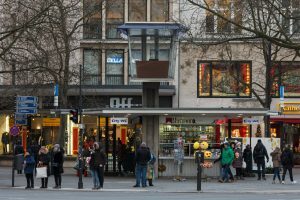 Using the wonderful Tempel aus Gusseisen by Hilmar Bärthel as a guide, I set out in June 2016 to track down and photograph all the Café Achteck remaining in Berlin. 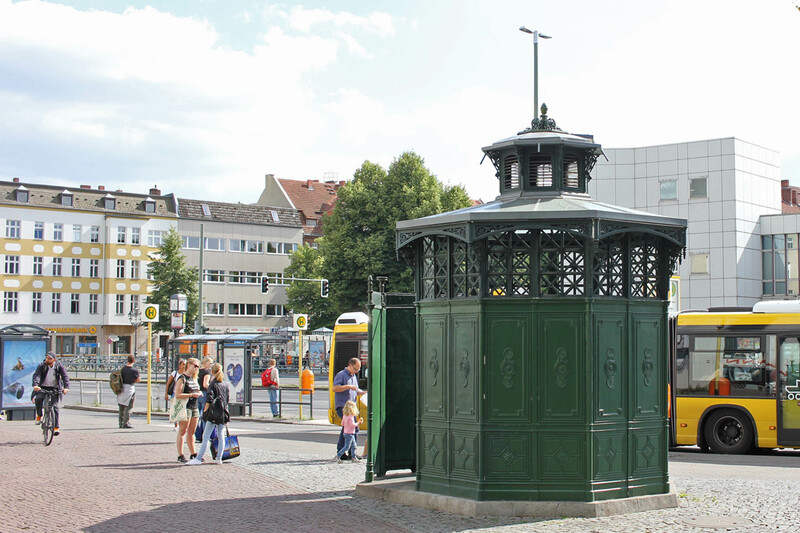 I was amazed to find that several of the cast iron pissoirs marked by Bärthel in his essay, published in November 2000, as ‘unter Denkmalschutz’ (having listed status) have since disappeared. 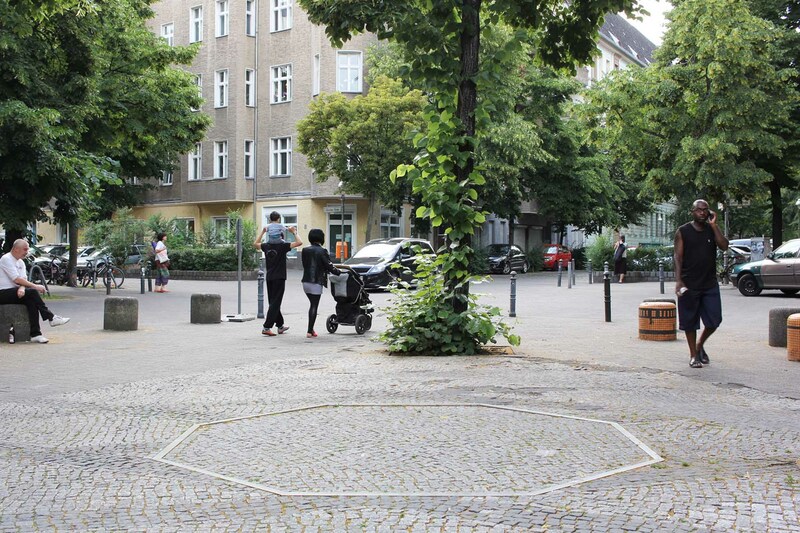 I found 13 Café Achteck still standing (marked in blue on the map), one of which, on Huttenstraße, is no longer in use as a toilet; the black pins indicate locations where the green pissoirs have since been removed – all that remains is an octagonal metal outline of the former footprint of the hut at Malplaquetsraße. 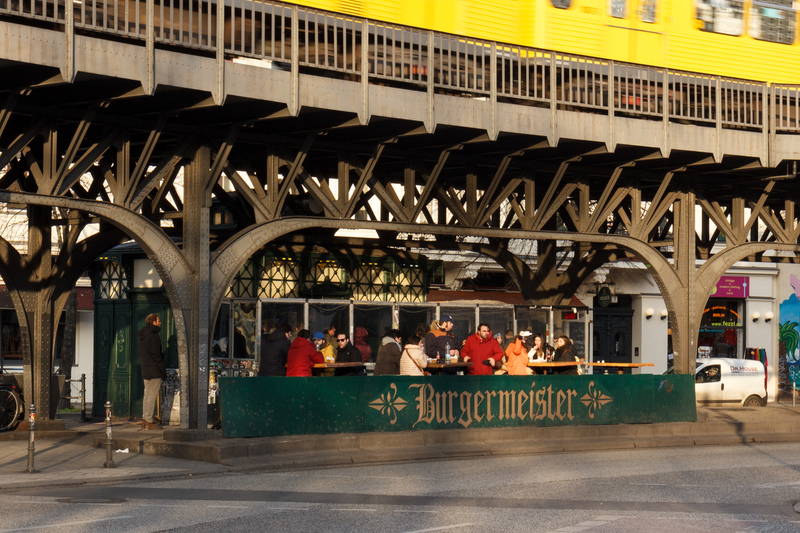 An example of the later rectangular model has been converted and now houses one of Berlin’s most popular burger joints, Burgermeister (marked in green) under the tracks of the U1 at Schlesisches Tor; and two further rectangular toilet blocks are still in use at Arkonaplatz and Boxhagener Platz (marked in yellow) and most likely used by flea market visitors on Sundays at both locations. 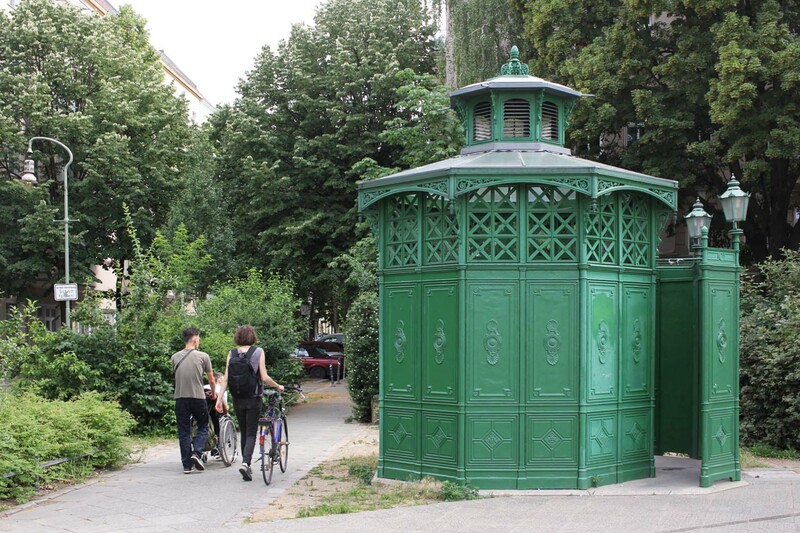 Toilets may not be glamorous but I sincerely hope that the remaining Café Achteck in Berlin are preserved as an example of a classic street furniture design and a 19th century solution to an eternal problem.